H.264 is also known as MPEG-4 AVC. It was developed for use in high definition systems such as HDTV, Blu-ray and HD DVD as well as low resolution portable devices such as PSP and iPod, H.264 offers better quality at lower file sizes than both MPEG-2 and MPEG-4 ASP (DivX or XviD).Are you searching for some application that can convert M2TS to H.264? Pavtube MTS/ M2TS Converter is the right solution for this as it converts the files from M2TS file format to customized H.264 MP4, MOV, AVI formats for iPod, iPhone, Apple TV, PSP etc. In the following guide I will show you how to convert M2TS to H.264 with the converter. Firstly, please make sure the M2TS Converter has been downloaded and installed. You may download its free trail version from here. It is a clean program for you to make full use of. To learn more information about Pavtube MTS/ M2TS Converter, please click here. Launch Pavtue MTS/ M2TS Converter and the window below will pops up. Click the Add button on the upper left and navigate to your M2TS files location, select those you want to convert. Now you can find the selected M2TS videos in file list. You can select any of them and click play button to preview. After you added M2TS files, you can select an output format for each video file and specify a directory on your computer to save the output files. Click the Format bar and follow Common Video to find H.264 MP4 in the expanded list. If you would like to maintain highest video quality, you may follow HD Video and choose HD MP4, MOV or AVI format encoded with H.264. When set output folder, you can either type in save path in Output box or click the icon folder and browse to the destination folder. To set advanced audio and video parameter, please click Settings. Here you can set video size, frame rate, aspect ratio, audio channel etc. 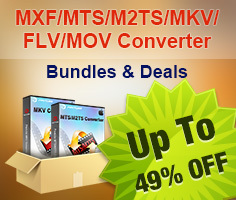 Click Convert button and the selected M2TS files will be converted at once. If you would like to join several files together, just select these files and check the Merge into one box before click Convert. You may check the converting progress and set auto shutdown in the convert window. Tip: Footages shot by some camcorders may ends up interlaced. Juggled edges and ghosting occurs when you preview the M2TS files. In that case you can set deinterlace effect to eliminate the combing. Follow Edit->Effect->Deinterlacing.